The Lord of the Rings film trilogy begins principal photography in Wellington, New Zealand, on October 11, 1999, under the direction of Peter Jackson, it was jointly announced today by Robert Shaye, Chairman and Chief Executive Officer of New Line Cinema; Michael Lynne, President and Chief Operating Officer of New Line Cinema; Michael De Luca, President and Chief Operating Officer of New Line Productions; Mark Ordesky, President of Fine Line Features; and Jackson, who is also a writer and producer of the production. 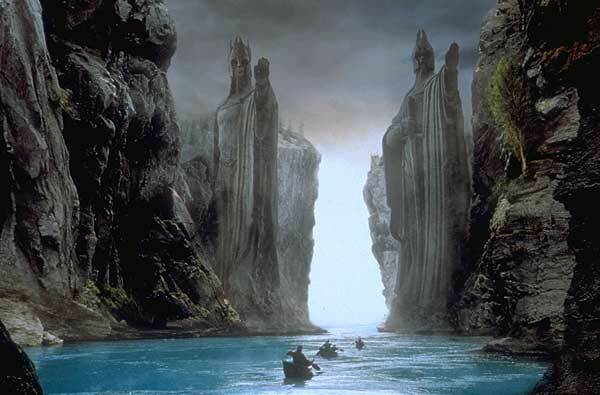 Unprecedented in scope, the production breaks new ground in movie-making by filming the three titles in this saga -- The Fellowship of the Ring, The Two Towers and The Return of the King - not consecutively but concurrently, as though they were all one giant motion picture production. Based on J.R.R. Tolkien's beloved series of fantasy novels, The Lord of the Rings franchise stars (in alphabetical order) Sean Astin, Sean Bean, Cate Blanchett, Orlando Bloom, Billy Boyd, Brad Dourif, Sir Ian Holm, Christopher Lee, Sir Ian McKellen, Dominic Monaghan, John Rhys-Davies, Stuart Townsend, Liv Tyler and Elijah Wood, whose casting was previously announced. The screenplay is written by Jackson (The Frighteners, Heavenly Creatures); his longtime production partner, Fran Walsh (The Frighteners, Heavenly Creatures); Philippa Boyens; and Stephen Sinclair (Braindead, Meet the Feebles). The producers are Barrie M. Osborne (The Matrix, Face/Off) and Tim Sanders (Aberration, The Frighteners) and Jackson, and the executive producers are Saul Zaentz (The English Patient, Amadeus), and Bob Weinstein and Harvey Weinstein (co-chairmen of Miramax). Walsh and Rich Porras (Contact) are associate producing under Jackson's WingNut Films Banner. Other members of the distinguished behind-the-camera crew include director of photography Andrew Lesnie (Babe, Babe: Pig in the City), production designer Grant Major (The Frighteners, Heavenly Creatures), costume designer Ngila Dickson (Xena, Warrior Princess; Hercules; Heavenly Creatures), and makeup and hair designer Peter Owen (Oscar and Lucinda, Philadelphia). WETA Workshop is executing armor, miniatures, creatures and special effects make-up under the direction of supervisor Richard Taylor. WETA Digital is executing the special visual effects under the direction of visual effects supervisor Mark Stetson (The Fifth Element and upcoming Super Nova). Visual effects producer for WETA is Charlie McClellan (The Frighteners, Contact). The conceptual artists are Alan Lee and John Howe, renowned for their illustrations of Tolkien's work. The official The Lord of the Rings website is www.lordoftherings.net. Coinciding with the start of principal photography, Houghton Mifflin is publishing a one-time-only millennium edition of The Lord of the Rings. For the first time, the Rings saga is being presented in a boxed set of seven hard-cover volumes, one for each of its six parts plus a seventh volume containing the appendices. One of the most beloved stories of the 20th century, The Lord of the Rings has sold more than 50 million copies worldwide in 25 different languages. Michael De Luca, President and Chief Operating Officer of New Line Productions, said: "The Lord of the Rings is among the greatest adventures ever written, and making this film is proving to be a wonderful adventure in its own right. Like Frodo, the hero of this saga, we're on a film 'quest,' and I can't think of anyone better to lead us than Peter Jackson." Mark Ordesky, President of Fine Line Features, said: "Filming three features simultaneously is a pretty daring proposition, but we have a wonderful team of filmmakers and actors who are more than up to the job and who are going to make this saga a deeply felt experience for moviegoers everywhere." Jackson said: "My team and I have poured our hearts into this project for the past three years, so it's a great thrill to begin actual photography. Filming three films at once has never been done before, in addition to which the project features state-of-the-art special effects, so it was essential to plan everything down to the last detail. We owe Professor Tolkien and his legion of fans worldwide our very best efforts to make these films with the integrity they deserve." As previously announced, Elijah Wood (Deep Impact, The War) stars as Frodo, a young hobbit who, by inheriting a seemingly innocent magic ring, finds himself launched on a perilous quest to save all of Middle Earth from encroaching evil. Other members of the cast include Sean Astin as Sam Gamgee, Frodo's most faithful friend. Astin gained early attention for his starring role in The Goonies and has since appeared in numerous films and TV productions, including Bulworth, Courage Under Fire, Rudy and Memphis Belle. He was nominated for an Oscar® for the short film Kangaroo Court, which he directed and produced. Sean Bean stars as Boromir, a human and the hot-blooded elder son of the ruler of the kingdom of Gondor. The rugged English actor has appeared in Ronin, GoldenEye, Patriot Games and The Field, among other films, and starred in the title role of Sharpe's Waterloo, Sharpe's Justice and the many other installments in the Sharpe series based on Bernard Cornwell's novels. Cate Blanchett stars as the elf Galadriel, the wise visionary queen of Lorien. For her performance in the title role of Elizabeth last year, the Australian actress won the Golden Globe and BAFTA awards as well as an Oscar® nomination. She has also been lauded for her performances in such films as An Ideal Husband, Thank God He Met Lizzie, and Oscar and Lucinda. Orlando Bloom stars as Legolas, a valiant elf who joins Frodo on his quest. Bloom has just graduated from Guildhall and has appeared in the television production Midsomer Murders. Billy Boyd stars as Pippin, a young hobbit and close friend of Frodo who accompanies him on his mission to destroy the magic ring. He has appeared in the TV miniseries Coming Soon and the feature Urban Ghost Story. Brad Dourif stars as Wormtongue, the manipulative adviser to King Theodon and a pawn of the evil wizard Saruman. Since making his film debut in One Flew Over the Cuckoo's Nest, for which he earned an Academy Award® nomination, a Golden Globe Award and a BAFTA Award, Dourif has appeared in over 40 films. Among these are Ragtime, Wise Blood, Blue Velvet, Alien Resurrection and all four of the Chucky movies, in which he provided the voice of Chucky. Sir Ian Holm stars as the hobbit Bilbo, Frodo's cousin and the original bearer of the magic ring. One of Britain's most distinguished actors, Sir Ian received BAFTA Awards for Chariots of Fire and The Bofors Gun. His many other credits include The Match, eXistenZ, King Lear, The Sweet Hereafter, The Madness of King George, Hamlet, Brazil, Greystoke and Alien. He also earned a Tony Award for his performance in Moonlight, and in 1989 he was awarded the CBE (Commander of the British Empire). Christopher Lee stars as Saruman, the chief of all wizards who hopes to snare the magic ring for himself. During a career spanning five decades, Lee has appeared in dozens of film and television productions. Recently, he starred in the title role of Jinnah, the story of Pakistan's founder. Other films include Tim Burton's upcoming Sleepy Hollow, Police Academy: Mission to Moscow, The Man With the Golden Gun, The Three Musketeers, The Wicker Man, the classic 1959 production of The Mummy and numerous horror films. Sir Ian McKellen stars as the wise wizard Gandalf, who is Frodo's mentor and protector. Sir Ian, who was knighted for his contributions to the performing arts, recently starred in Gods and Monsters, for which he received many awards and an Oscar® nomination. His screen successes include Apt Pupil, Scandal, And the Band Played On (Emmy nomination and CableACE Award), Cold Comfort Farm, Rasputin (Golden Globe Award), Richard III, Bent and Swept From the Sea. He has had a stellar career on stage in England and the U.S., and received the Tony Award for his role in Amadeus. Dominic Monaghan stars as Merry, a mischievous young hobbit who accompanies Frodo on his dangerous quest. Monaghan has appeared in a number of theatrical and television productions, including the BBC series Hetty Wainthrop Investigates, with Patricia Routledge. He has also appeared in the film Boomer, directed by David Drury. John Rhys-Davies stars as Gimli, who represents the dwarves in the Fellowship of the Ring. One of the busiest actors, Rhys-Davis has been seen in television productions ranging from Shogun to Sliders and in films ranging from the three Indiana Jones films to The Great White Hype. A few of his other credits include the miniseries War and Remembrance, Noble House and Reilly: Ace of Spies, and the films The Living Daylights and Victor/Victoria. Stuart Townsend stars as Aragorn, a human raised by elves and the rightful king of Gondor. The Dublin native appeared on stage before making his film debut in Trojan Eddie, with Richard Harris and Stephen Rea. Other film credits include Under the Skin, Shooting Fish, Resurrection Man and Wonderland. Liv Tyler stars as Arwen, a young elf warrior and princess who is prepared to give up her immortality for love of Aragorn. Tyler recently starred in Cookie's Fortune, Plunkett & MaCleane and Onegin. The former teenage model has also starred in Armageddon, Inventing the Abbotts and Stealing Beauty, among others.